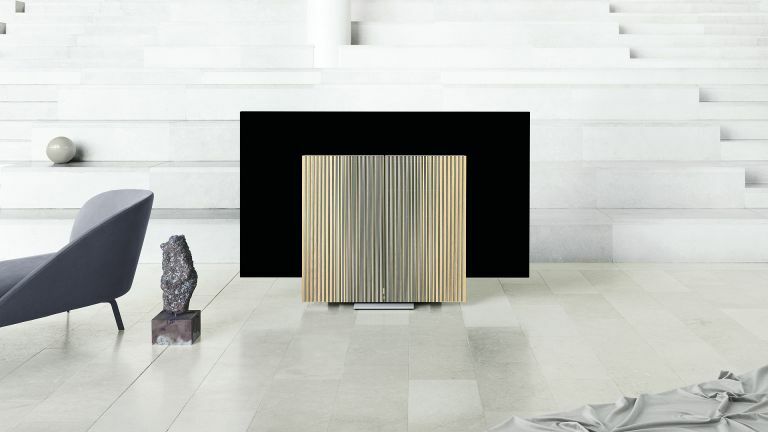 Bang & Olufsen just pushed the design envelope hard with a radical new 77-inch OLED TV, dubbed the Bang & Olufsen Beovision Harmony, at (where else?) Milan Design Week. An ultra-stylish TV furniture hybrid, the Beovision Harmony is distinguished by a wood and aluminium frontage, which houses the set’s audio system while obscuring the panel. Powered up, these enclosures fan out as the 4k OLED screen behind rises to viewing height. The innovative design features typically elegant engineering from the Danish brand. Like LG’s scene-stealing rollable OLED panel, unveiled as CES, the Beovision Harmony seeks to address the issue of burgeoning screen size by using ingenious design to reduce physical footprints. When in Standby, or being used for music playback, the OLED panel sits just off the floor, largely obscured by the wooden frontage. Bang & Olufsen says the mechanism is akin to a butterfly opening its wings. Although at 77-inches, it’s more Mothra from Godzilla than Cabbage White. When the TV is off, the screen sinks to the floor and the speakers fold back into place. Fashionistas have a choice of oak wood and aluminium, or Grey Melange two-tone fabric and aluminium finish. The set’s arty sound system is a three channel design out of the box. However, as the set has a 7.1 surround sound decoder, it can also be partnered with exterior Beolab speakers for a full-blown home cinema experience. For Bang & Olufsen devotees, the Beovision Harmony also integrates with the brand’s multiroom wireless ecosystem. The concept behind the Harmony builds on Bang & Olufsen’s heritage of elaborate cocooned home entertainment systems. AV historians will know it’s a descendant of the Capri series, launched in 1959, which hide its CRT screen in a (then) fashionable teak cabinet. Design roots may be fashionably old school, but the tech is on point. In addition to integrated streaming music services, there’s support for Apple Airplay 2, Chromecast built-in and Bluetooth. The Beovision Harmony is built around an LG C9 panel and uses the webOS 4.5 smart platform, which comes with all the usual streaming services - including Netflix, Amazon Prime Video and YouTube. • The 77-inch Beovision Harmony will sell for 18,500 EUR (and something similar in sterling) when it ships in October.